The Raid Finder tool makes grouping a cinch, and the encounters will be easier too. If you've ever raided with a pick-up group in World of Warcraft, you know that people on the whole are dumb. The reason why raiding takes up so much time is that guilds need to coordinate battle plans and practice encounters for hours and sometimes days and weeks before beating even the easiest bosses. For a group of players that just got together five minutes ago, most raid content in WoW will kick them to the curb. Blizzard is always trying to get more WoW players to enjoy the high-level content the team produces, so that's why lead producer J. Allen Brack will implement the Raid Finder tool in Patch 4.3. 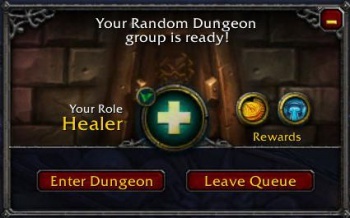 Not only will this feature automatically place you in a 25-man group set to raid, but Blizzard is setting the difficulty for raids formed by the tool to be easier than what is currently available - hopefully ensuring that players won't get discouraged by seeing that terrible angel of death fifteen times on the first encounter. "We really want [the tool] to be a way for players to get into and experience the highest level of raid content," said Brack in our interview. "Right now, we have some PUGs [Pick Up Groups] that are able to work where it's a very manual process for players to [group up]. They're probably not able to do the highest level of content but there's something that they want to do. "What if we, instead of having players kind of struggle to get this group together so that they can experience a content level behind, what if we just create a system that allows players to auto match-make and automatically facilitates them getting into the most recent content at a different difficulty level." Players who enjoy the dungeon finder first seen in patch 3.3 of Wrath of the Lich King will find the raid finder familiar. "The idea behind this is that it is very similar to the dungeon finder we have now except that it is for raids," he said. "It is cross-server [and] we will do some auto match making very similar to how it is looking for dungeon. There are special rules associated with how [the Raid Finder] is going to work: the first one is that the raid finder is going to be for 25 person only, it's not a way for you to have 10 person raids, it's only for 25 person." Raid difficulties are currently in four tiers - normal 10 man, heroic 10 man, normal 25 man, heroic 25 man - but raids formed using the tool would be on a new as yet unnamed difficulty level. "We haven't figured out exactly what it's going to be called but there will be a difficulty level easier than normal mode," Brack said. You'll end up having this raid finder mode then you'll have your normal mode and your heroic mode. The normal and heroic modes are exactly what they are today." Because everything will be easier and Blizzard doesn't want to devalue the current raid rewards, you won't be able to earn phat lootz when using the tool. "There will be restrictions as well for players: you won't be able to get your achievements done, you won't be able to get your titles or your mounts or your awards in that way as if you complete them on normal/heroic," Brack said. To compensate, "We'll have special achievements that are specifically for looking for raids tier of difficulty." The whole point is to make as much content available to as many players as possible. "We're trying to make this at some same level of frictionless entry where you can go on and experience Deathwing content and immediately get on and enjoy that content," said Brack. For a dedicated WoW-player that could never find the time to develop the relationships needed to get into a raiding guild and who therefore never saw the most epic raid content, the raid finder sounds great. But I can see the people who do raid every night being upset that Blizzard is ruining the game. What do you think? Will you use the raid finder tool? For more details on Patch 4.3, head over to the full interview with WoW lead producer, J. Allen Brack.